Cool new Trips feature in Inbox started rolling out today. 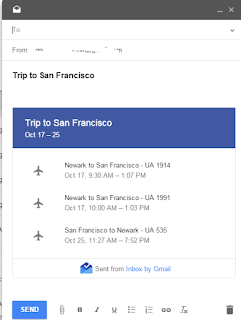 Now instead of just forwarding a particular email to a friend, family member, or co-worker, using Inbox you can share with them the entire trip. Trips will now have a nice little share icon, when clicked will popup a new email compose window with a snapshot of the trip details.